When you sponsor or host an event, do you want to be a footnote or an integral part of the event experience? Your brand shouldn't be relegated to a banner, the bottom of the menu, or a short mention from the MC. Your brand should be featured throughout the event, as part of unique moments that the guests are actively engaged with. So whether your event is a product launch, store opening, fundraiser, or other occasion that leverages the potential for events to serve as brand activations, you need to use fresh branding strategies. What are some interesting ways that aspects of the event experience can be branded? Logos can be created with edible silver dust on the surface of a cocktail at a fundraiser, placed onto inflatable pool toys at a pool party, or the napkins for a dinner party might serve as another subtle branded element. Perhaps best of all these ideas, a TapSnap photo booth can serve as not just a way to brand an event, but also entertain event guests and spread brand awareness on social media. How does TapSnap brand an event, entertain guests, and spread brand awareness? 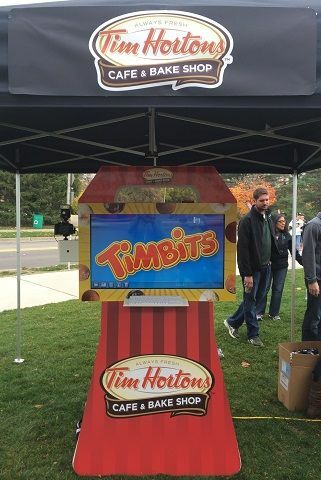 First of all, a TapSnap photo booth can become a branded part of the event space through the customization of the kiosk itself, as well as its 42" touch screen display. Especially creative event planners can even create branded props! Secondly, TapSnap entertains guests by providing photo entertainment, a step up from the traditional photo booth experience, wherein taking and customizing a photo is a ton of fun due to our open-air design, physical and digital props, and custom green screen backgrounds. Finally, TapSnap spreads brand awareness due to our social media capabilities. Photos can be automatically branded with banners and logos, so that when a guest shares their fun photo via Facebook, Twitter, or email, branded content is shared with their whole social media network. So are you ready to experiment with fresh branding strategies to ensure that your upcoming event really engages customers with your brand?